At Broad Reach Benefits we're specialists in your world. We've worked diligently to develop a completely different business model aimed at Law Firms with client relationships at the center of what we do. Our team of employee benefit advisors want you and your firm to be successful, not just a client. With years of experience serving the law firm community, our employee benefits team understands the complexities of designing, installing and servicing employee benefit programs and “executive level benefits” for the attorneys and staff within your firm. The needs of your partners differ from those of your young associates, which, in turn, are not the same as those of your staff. This may be obvious to you, but only an employee benefits firm that works with the legal community every day will understand that you are very different from a typical employer with executives and rank and file employees. The Broad Reach Benefits team has provided employee benefits and insurance to law firms since 1991. We understand the unique culture of law firms and have assembled a staff with the education and training that allows them to provide the high level of professionalism required to interact appropriately with you, your attorneys and staff. 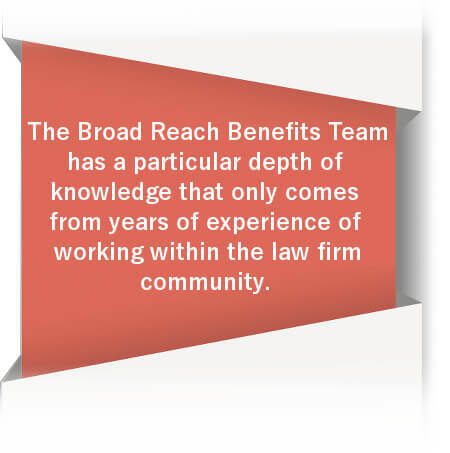 From some of the largest law firms down to small offices with only a few attorneys, Broad Reach Benefits is trusted by the best in the legal community. You’ll get the results you need to help you control your employee benefit costs, implement plans that meet the specific needs of your firm and satisfy your attorneys and staff. While we can tell you about our skills and experience, we know that the best testament to what we can do is the many satisfied law firm clients we have served. We would be happy to provide a list of references, upon request. Are your employees located in more than one state? At Broad Reach Benefits, we build true relationships with the law firms we serve. We understand that people matter. We get to know you, your attorneys, staff, and their families. We’re here when you need us and proactive, helping before you even know you have an issue. If we sound like the kind of organization you’d like taking responsibility for the needs of your firm, give us a call. You really should take a few minutes to talk with our existing law firm clients to learn about the level of service and support you could be getting from your employee benefits broker. We’re here to help. Call us and speak to one of our staff who will be more than happy to answer any questions you might have. Email us and our president will get right back to you to explain how our team will help you make your firm and its benefits more attractive than those offered by your competitors. Start the conversation. We frequently hear from our law firm clients that we are like no other employee benefits firm they have ever worked with. Learn more now.